Increasingly troubled by gun violence in the United States, artist-activist and former educator Cathy DeForest decided it was time to catalyze individuals to create change. 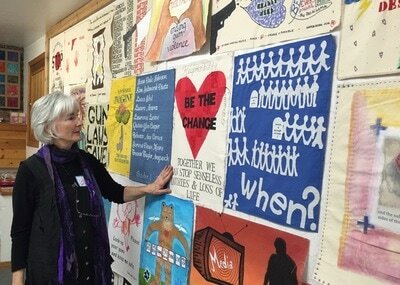 Inspired by the AIDS Quilt’s success in raising awareness of and shifting perspectives on HIV/AIDS, she imagined a nationwide project that would address gun violence through creative expression and inclusive dialogue. Cathy invited a diverse group of individuals to create 18 x 24-inch panels conveying their visions on how to prevent gun violence. A core group of volunteers set the direction for Vision Quilt. 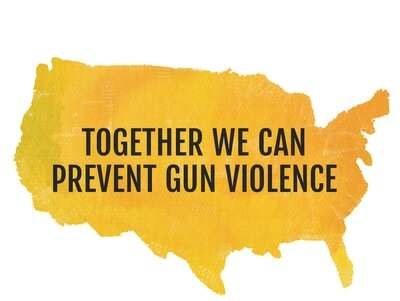 They chose a map of the United States as the logo for Vision Quilt with the words Together We Can Prevent Gun Violence to show both the national focus of Vision Quilt as well as the intention of bringing diverse individuals together to create social change. Beginning in the winter of 2015, initial Vision Quilt workshops hosted by volunteers reached a wide spectrum of participants including survivors, students, retirees, veterans, politicians, and gun owners, as well as artists, writers and educators. Interest in Vision Quilt has grown rapidly through volunteers and workshops in Oregon, Massachusetts, Arizona, California, Pennsylvania, New York and Illinois. 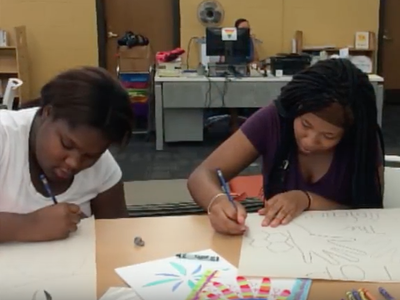 Vision Quilt expanded its focus to underserved and incarcerated populations in 2016, with panel workshops at San Quentin State Prison, Alameda County Probation Department’s Camp Sweeney for incarcerated youth, and at-risk populations in Chicago through the National Veterans Art Museum and the Chicago Public Library. In Oakland, California, our partners include Lighthouse Community Charter School, Youth ALIVE!, and the Public Health Institute's FACES for the Future. In Southern Oregon, outreach included homeless youth and middle school students and at-risk student after-school programs. Vision Quilt panels have been exhibited in community centers, museums, public schools, churches, universities and worn in rallies, marches and vigils. A professional Vision Quilt kit, including workshop guidelines and materials, curricula, a community action guide and a model for inclusive dialogue, was created and is now available to communities who wish to integrate Vision Quilt into their ongoing work to prevent gun violence. The Vision Quilt website showcases results, resources, and the ever growing Virtual Vision Quilt. Vision Quilt became a nonprofit 501(c)(3) in September 2016 and formed its first Board of Directors. The Board decided in its strategic planning process that the main focus of Vision Quilt will be to serve youth in communities with significant gun violence.